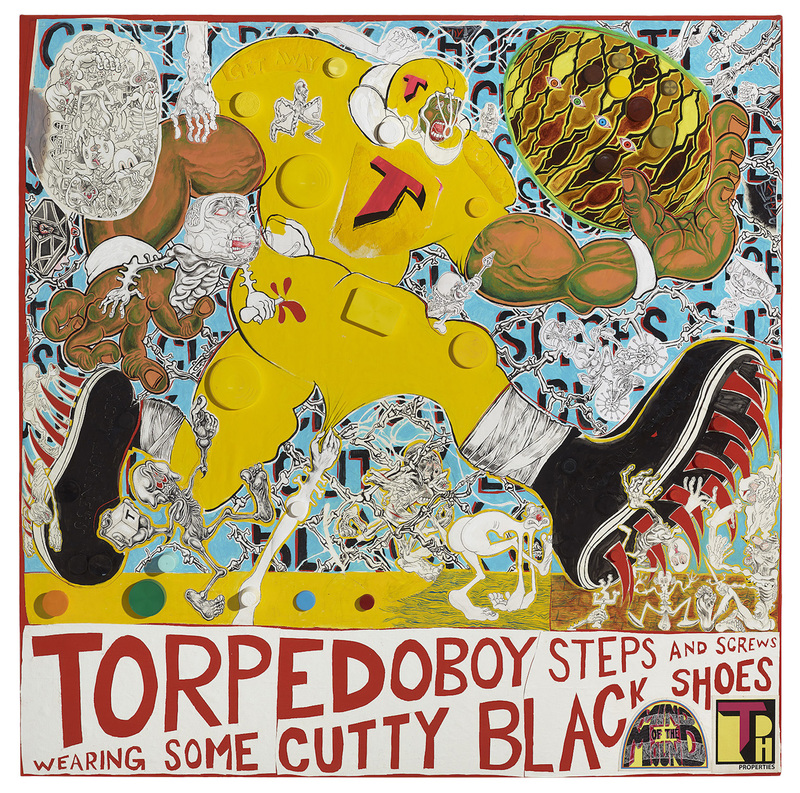 For almost two decades, Trenton Doyle Hancock’s elaborate works have interlaced personal memoir with the history of painting and pop-cultural imagery. 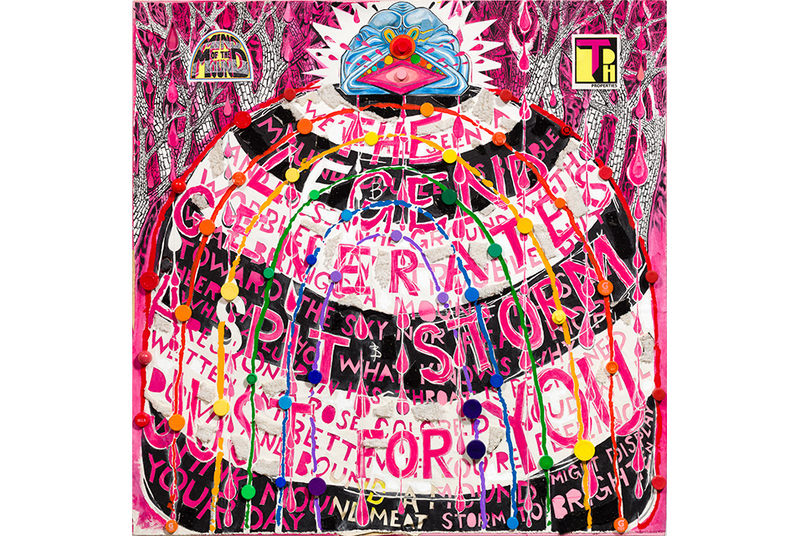 Raised in a Southern Baptist household, the artist spent his childhood immersed in biblical subjects whose power can now be seen in his ongoing exploration of universal themes of good and evil. 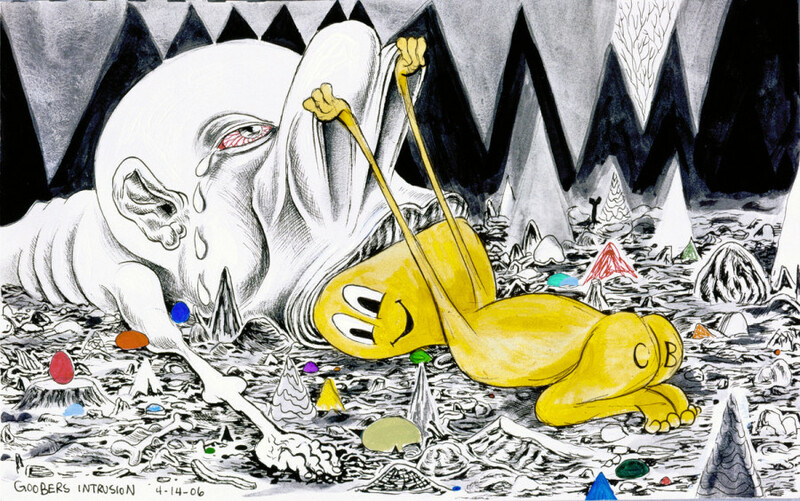 As Hancock states, “Archetypes of heroes going through toil and trouble and coming out all the better for it,” have been central to the way he constructs his visual narratives. Oscillating between figuration and abstraction, Hancock assembles compositions in a variety of media. 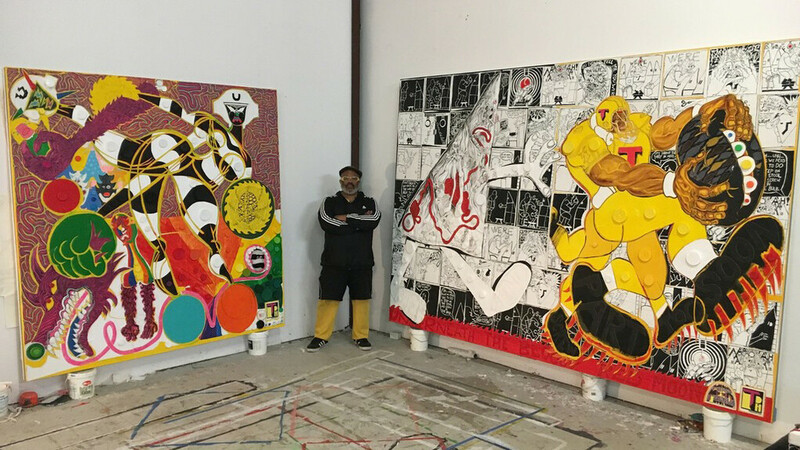 The artist transforms formal decisions—the use of color, language, and pattern—into opportunities to build motifs, challenge narrative structures, and overturn traditional symbolic meaning. Infused with both personal and cultural mythologies, Hancock’s dense and subversive storylines employ tropes, ranging from comic-strip superhero battles to medieval morality, often introducing text as a key visual component that further complicates the narrative. Trenton Doyle Hancock (b. 1974, Oklahoma City, Oklahoma) grew up in Paris, Texas. 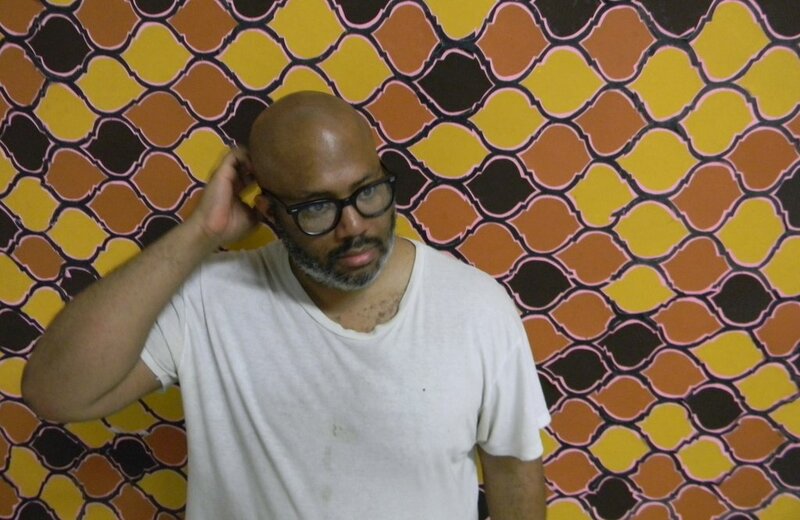 Hancock was featured in the 2000 and 2002 Whitney Biennial exhibitions, becoming one of the youngest artists in history to participate in this prestigious survey. 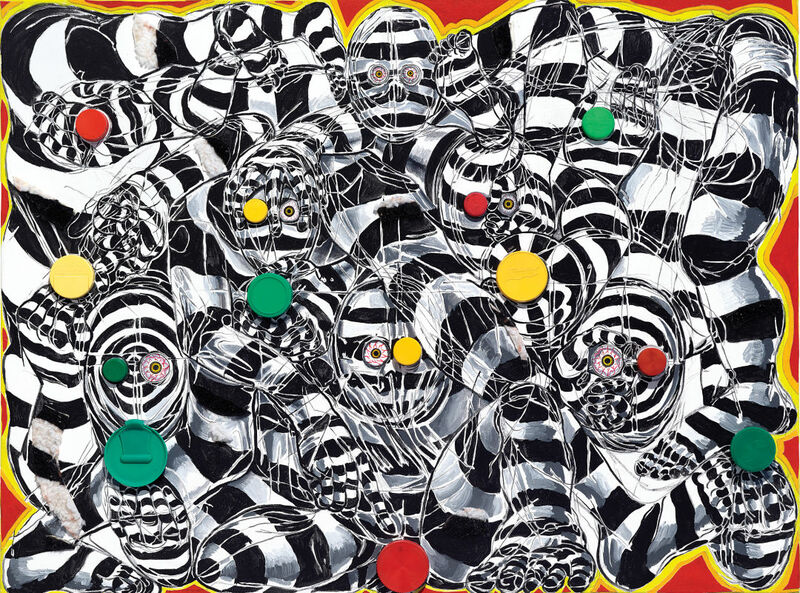 In 2014, his exhibition Skin & Bones: 20 Years of Drawing was presented at the Contemporary Arts Museum in Houston, and traveled to Akron Art Museum; the Studio Museum in Harlem; and Virginia Museum of Contemporary Art. A solo exhibition of his work, Mind of the Mound: Critical Mass, will open at MASS MoCA, North Adams, MA in 2019, and travel to Dallas Contemporary, TX. 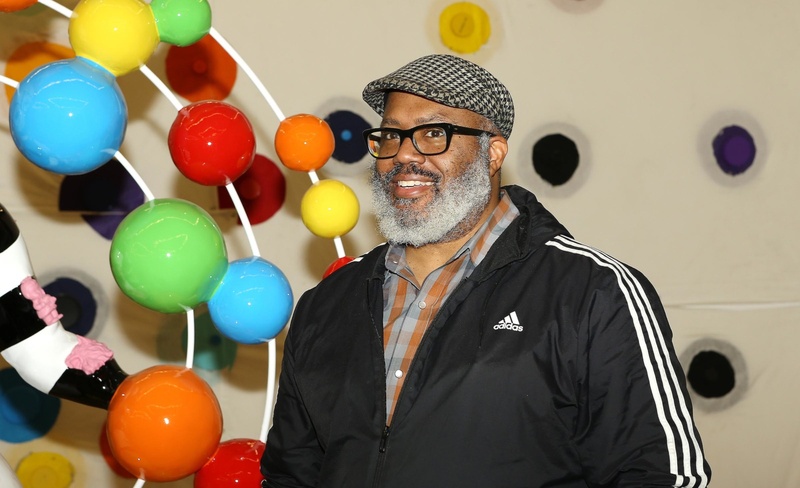 His work has been the subject of one-person exhibitions at The Ringling Museum of Art; The University of South Florida Contemporary Art Museum; The Savannah College of Art and Design; The Weatherspoon Museum; The Modern Art Museum of Fort Worth; The Museum of Contemporary Art, North Miami; Institute for Contemporary Art at the University of Pennsylvania; Olympic Sculpture Park at the Seattle Art Museum; Fruitmarket Gallery; and Museum Boijmans Van Beuningen. Hancock’s world has been translated into performance in the original ballet Cult of Color: Call to Color, commissioned by Ballet Austin; and through site-specific murals for the Dallas Cowboys Stadium in Dallas and at the Seattle Art Museum’s Olympic Sculpture Park. In 2019, the artist will present his most comprehensive exhibition to date, Mind of the Mound: Critical Mass, at MASS MoCA, North Adams, MA. The artist’s work is in the permanent collections of the Museum of Modern Art, New York; The Whitney Museum of American Art; The Metropolitan Museum of Art; Brooklyn Museum; The Studio Museum in Harlem; Los Angeles County Museum of Art; San Francisco Museum of Modern Art; Baltimore Museum of Art; Columbus Museum of Art; The Contemporary Museum, Honolulu; The Cooper-Hewitt National Design Museum; Dallas Museum of Art; High Museum of Art; Museum of Fine Arts, Houston; Modern Art Museum of Fort Worth; Kemper Museum of Contemporary Art; Museo di arte moderna e contemporanea; Museum Boijmans Van Beuningen; Virginia Museum of Fine Arts; Warhol Museum; and Wexner Center for the Arts at Ohio State University. Growing up in Paris, Texas, in a religious household filled with portraits of his mother and lavishly illustrated children’s books, Trenton Doyle Hancock identified as an artist from the very start. Just a year or two after his first baby steps, his great-aunt taught him how to draw farm animals.